At many properties, dealing with speeding vehicles is a constant challenge. This is especially true for properties with high pedestrian activity, such as apartment complexes, shopping malls, and retail centers. As a result, a plan for dealing with speeders at your property is a must. Here are our top tips. While expensive, speed bumps are a guaranteed way to slow down traffic at any property. This is especially true for larger speed bumps because they can damage vehicles. Most paving contractors install speed bumps, can do the work in one day, and have them installed with minimal disruptions. For properties that already have speed bumps, make sure they are marked with signs and not crumbling or falling apart. If they are, consider having them repaired or replaced. Click here to get a free speed bump installation quote. Any property with a parking policy should include a section that addresses speeding. Additionally, require vehicles registrations to include license plate information. In turn, try to observe the tags of any consistently speeding vehicles. While not a perfect system, this can at least make it possible to identify offenders. Finally, if your parking policy allows it, enforce any available penalties. This commonly includes fines, loss of parking privileges, or towing any vehicles that constantly violate posted speed limits. Reminding residents to slow down can often be the easiest solution to the problem. One of the best ways to quickly and easily send a reminder is sending a community wide email. Another great way to send a warning is posting to the property’s Facebook Group. With any luck, these digital reminders will do the trick and get cars to slow down. Before spending the money to install speed bumps, property managers should absolutely send slow down reminders. If they solve the problem, it can prevent a major project and expense. As an alternative to speed bumps, property managers can install proper road signs. 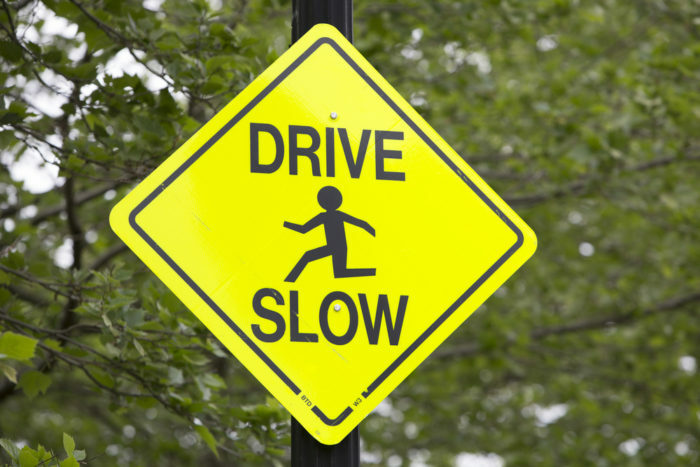 These familiar signs are common on many properties and simply remind vehicles to slow down. Additionally, property managers could explore adding a stop sign, when appropriate, to slow vehicles down. Adding a sign or two is another first step with considerably lower costs than installing speed bumps. Another strategy for dealing with speeders at your property is asphalt striping. 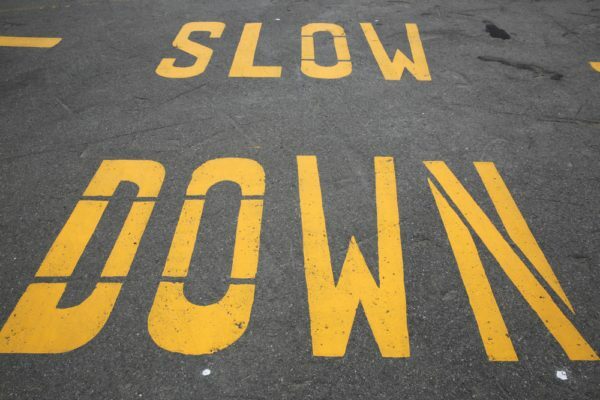 While signs and speed bumps both work to slow down speeders, striping can be equally effective. This is simply done when having striping your ADA parking spaces and parking lot. Have you asphalt striping contractor add “SLOW DOWN” on the roadways. This type of warning is most effective in areas where vehicles most frequently speed. In addition to being an effective technique, asphalt striping is another cost effective alternative. While a speed bump can cost anywhere from $4,500 to $7,500 according to the Washington Post, striping is significantly cheaper. It can cost only a few hundred dollars to stripe speed warnings. Have another great strategy for dealing with speeders at your property? Send us an email with your best tips and we will add them to this post!